There is no such thing as an incurable disease and I’m going to tell you why in this article. Not only is there no such thing as an incurable disease, there is actually no such thing as disease! It was never my intention to be a doctor, ever. I had been a student of life and health from the age of 16. If one studies life and health, it becomes clear quite soon that the last thing in the world you’d want to do is get into the medical profession because its anti-life, anti-health. It’s really disease care, not health care. I went off to India and I lived in there for a while and wound up back in the U.S. and went into psychology and became a practicing clinical psychologist. And it was in that time that I kept seeing that I didn’t understand disease and how it affected people. I didn’t understand what effect medications had on people. And not having that understanding, I felt like there was something lacking in my ability to work with people. So I went to medical school for that purpose, not to be a doctor. It was just to round out my vision. Now, I’ve come to know that there’s no such thing as disease. It’s a myth. The major obstacle is that we humans are living under a very extreme bizarre delusion that we are not part of nature, which is insane. We are part of nature. We are an expression of nature. Just as a planet, a sun, a star, a supernova, a bacterium, a tree, they’re all expressions of nature. And for some reason, we came to the conclusion that we’re not part of it all. We have separated ourselves, and we live in boxes and drive around in machines and cover our bodies and don’t want to touch the earth. We have a pejorative term for the earth. We call it dirt. We totally separated ourselves, in our minds. We have a completely artificial environment we live in. We don’t live in the habitat out of which we arose, because we know that a sea bass arose out of the oceans and that sea bass will achieve its optimal functioning in saltwater, not in a freshwater lake. And for the same reason, you can’t take a polar bear and put him on the equator, optimal functioning of the organism is needed, which is the only definition of health that works. Optimal functioning of the organism has to occur out of the environment in which that organism would have its function. We left our habitat. Then we built an artificial habitat. Well, you notice that the wild animals don’t have heart attacks, don’t have strokes, don’t have arthritis, don’t have colitis, don’t have cancers. They don’t have those things. Those things are only for us and our domesticated pets, the ones that we treat just like us. If someone walks up and pushes you, the immediate thing your body does is fall this way. If you get hit by a car and you’re flung forward, you fling backwards. Okay, this is what’s called a knee-jerks reaction or a non-thinking response to maintain what’s called homeostasis, balance. Livers do what livers do only. They don’t ever do what hearts do. Everything is following the law. It’s the same as water flowing downhill. It’s just going to flow the most perfect path ever. And that’s just the way it is. It’s the nature of nature. So what we need to understand is that when there’s a disturbance to the integrity of the entire system, my 100 trillion cells that make me up, when there’s a disturbance to that, the body, the matrix that runs it, the magnetic pulse of the heart, this whole thing seeks to establish balance. That’s all it does. So my arteries are clogged up because I’ve been eating food that wasn’t designed for me. So my body in its wisdom says, “Gosh, got to get the blood out to those organs through plugged up arteries, I guess I’m going to have to increase the blood pressure.” So it increases the blood pressure and we call that a disease. We say, “Well, I got a disease called high-blood pressure or hypertension.” It’s not a disease. It’s a corrective measure that the body underwent to keep us alive. If it didn’t do it, we’d die and the same applies with cancer. If a woman didn’t get that breast cancer, her breasts would turn black, become necrotic and fall off. It’s all a corrective measure. When we understand that, we understand that nature is always in a process of maintaining balance and that for us to have the audacity or ignorance to come along and think we’re going to cure the cure or that the cure itself that nature is doing is somehow wrong. 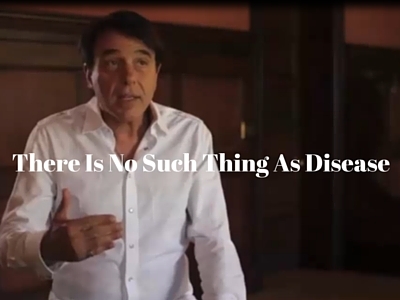 There is no disease. There’s only this other thing. What we need to do is very simple. Return to and live according to the laws that govern our biology. And guess what? Your body won’t need to do the high blood pressure dance. It won’t need to do the cancer dance. These are just dances it’s doing to stay afoot, to stay afloat.